Located in St. Louis County real estate, homes for sale in University City MO are centrally located in an inner ring suburb the St. Louis area. University City is considered a diverse residential community with an array of boutique stores and specialty restaurants. University City real estate is made up primarily of well-established homes. Homes for sale in University City MO range in price from about $50,000 to $800,000. The median home price in 2014 was approximately $310,000. Residents of University City enjoy an eclectic array of shopping and entertainment. The Tivoli theater screens Avant-garde, foreign and independent films. You will also find outdoor markets, outdoor chess champs playing in the Delmar Loop. The city also provides concerts and movies in the park during the Spring, Summer and Fall months. The University City School District provides a pre-school, four elementary schools, Brittany Woods Middle School and University City High School. See Great Schools for up to date ranking on every school in the area. If you are looking for a home for sale in University City MO or you would be interested in buying a home in University City, please contact St Louis County real estate expert, Sharon Colona and St. Louis Realty for a professional and simple buying or selling process. Call (636) 397-7653 or email at scolona@stlouisrealty.net. This 1909 Eames and Young property provides many modern conveniences while maintaining its historic beauty. Surprisingly private, with very few sight lines from neighbors and the park directly in front, it is in easy walking distance to the University City Civic complex, the Loop, the Metrolink and Washington University. As previous owners undertook several major projects to aid its sustainability(boiler replacement, extensive insulation, landscaping), in addition to replacing the roof and two updated baths, little maintenance should be required. Many of the original details remain throughout: high ceilings, pocket doors, beautiful fireplaces, box beamed ceilings, crown moldings, original hardwood floors and more. Be sure to ask about the first owners of this property. It has a story to tell! Showings begin 4/5. Rare opportunity to own one of the largest homes in Brittany Wood. Flat backyard perfect for a pool. This 4 bed/3 bath home offers incredible space at a fantastic price.This special house is perfect for entertaining. A grand entry opens to a vaulted living room with a massive fireplace, a generous dining room with a large bow window overlooking the backyard, & a huge family room that can be used as a main floor master. The kitchen features incredible storage space with floor to ceiling cherry cabinets, an island with granite counter, double ovens (one convection) & an eat-in kitchen. xD; xA; xD; xA;A large master suite has expansive ceilings with skylights, two walk-in closets, & en suite with separate tub and shower. Two beds and a bath complete the 2nd floor. The clean, expansive basement is ready to finish. Imagine entertaining on the over-sized deck or sitting on the covered front porch gazing at the landscaped yard and park space in this sought after neighborhood. Gorgeous Parkview home with the best of both worlds, old world charm & modern updates. Walk to Forest Park, Wash U, the Loop, restaurants, entertainment & shopping. Special one-of-a-kind home w/ a fantastic front porch w/ porch swing, lots of windows and light streaming in to showcase the original woodwork, entry foyer w/columns, beamed ceilings, hardwood floors, 10 rooms, 5 bdrms, 2.5 bathrms, 2 car garage, updated gourmet kitchen w/ 2nd staircase up, pocket doors, original claw foot tub, and stunning stained & leaded glass throughout. Zoned cooling, wood burning fireplace w/ a fabulous original fireplace cover. In University City's Historic Parkview Neighborhood. The entire neighborhood including the 2 private parks, the street, sidewalks & the very expensive cast iron street lights are a single historic place on the National Register. A private park is right across the street from this home. Municipal Inspection Occupancy Permit provided at closing. Great deck and gardens in back. If you still haven x2019;t found what you are looking for look no further than a newer construction home built in 2000 with the architectural charm of yesteryear in University Park. This bright, open and airy 1st floor plan is an entertainer x2019;s delight. The large family room with gas burning fireplace opens to the eat-in kitchen with peninsula, white custom cabinets, SS appliances, granite counters and built-in serving area. Along with the modern floor plan, a formal living room/sitting room & dining room for the special occasions. 1st floor is finished with beautiful oak hardwood floors. The 2nd floor master includes a generous walk-in closet, en-suite bath with double vanity and separate tub/shower. Jack-n-Jill room with attached bath. 2-car garage. Easy to maintain landscaping. Brick patio. Flanked by two popular University City parks with great play sets and green space. Easy walk/drive/ride to Wash U, University City Loop, Downtown Clayton and hwys. Rare find in University City! This is a wonderful home. Location and Charm in this beautiful home in Historic Parkview. Walking distance to great private and public schools. Architectural & original features lend style & warmth. Located within walking distance of Washington University, Forest Park, and the Delmar Loop's restaurants and shops. Large foyer leads to the living/dining room & family room. Fenced back yard has a raised bed garden and children x2019;s play set. Kitchen has a large island, 5 burner gas cooktop & eating area & double ovens. The back door opens to deck for outside dining and entertaining. Partially finished basement. Laundry is set up for two washers and two dryers! Six bedrooms and three and a half bathrooms provide ample space for sleep, study & family. All appliances can stay with the home. Just steps away from Clayton, this 2 bedroom, 2.5 bath condo has it all. This one owner original display unit offers a spacious open floor plan with 9 x2019;ceilings, some wood floors, lovely moldings and appointments and neutral d xE9;cor. The living room has a bay with a window seat, fireplace and sliding doors that open to private terrace with steps to the backyard. Great dining room with trey ceiling and kitchen/breakfast room with granite countertop and custom cabinets. Spacious master bedroom suite with bay window, private bath with double vanities with granite, separate whirlpool tub and shower and huge walk in closet. A second guest bedroom with full bath and laundry room with full size washer and dryer complete the unit. Two reserved garage spaces, two storage units, secured entry and elevator building. This stunning 1936 home boasts all of the desired features of older homes with the conveniences of modern living. Meticulously maintained, this home has had countless updates and repairs to keep the original character fresh and up-to-date! The main floor includes a family room with gas fireplace and separate living room with a show-stopping Italian marble fireplace. The updated kitchen features fresh paint, granite countertops, beautiful ceramic tile backsplash, stainless steel appliances, and cherry wood cabinets. The upper level includes three bedrooms and a full bath that has been completely updated with Bath Fitters. The partially finished lower level includes a rec room for additional living space, as well as unfinished space for storage. Exterior features include a detached two-car garage, beautifully landscaped front, and back patio. Located within walking distance to the downtown Clayton shops, restaurants, and public transportation, this home x2019;s location couldn x2019;t be better! New windows, new paint, and a new outdoor entertaining room add to the livability of this house all at a great, new price. xD; xA; xD; xA;This charming home in sought-after Brittany Wood has been tastefully updated with a layout for entertaining. The living room features built-in bookcases and a fireplace, and the dining room has built-in corner cabinets. The recently renovated kitchen has high-end cabinetry,stainless appliances,granite counters and a farm sink that overlooks a beautifully landscaped backyard. An additional room on the main floor is perfect for a den/breakfast or playroom. xD; xA; xD; xA;The master has both shoe and walk-in closets, and a large, modern master bath with a shower big enough for two.Two additional bedrooms share an updated Jack & Jill bath. xD; xA; xD; xA;There is a semi-finished basement, and just wait until you seethe finished attic (900 sq ft). The attached garage is perfect for a great room or first-floor bedroom suite. Absolutely adorable 4 plus/ 2.5 bath Tudor Craftsman in desirable University Heights with over 2300 square feet. Lots of living space, hardwood floors, and a completely renovated kitchen and bath are first floor highlights. Upstairs, there are four oversized bedrooms, an updated bath and tons of closet space. Don't miss the full basement which offers a surprising amount of space and half bath. Come spring, or even a random warm winter day, you'll enjoy the great yard with terraced porch, deck and patio with fire pit. All this plus a two car garage and great U City location. Charming home redone from top to bottom to unite architectual details of old w/ fresh, inviting decor throughout. A lovely living room w/ gas fireplace opens to the dining room & cheery breakfast room. A sunroom addition w/ wall of closets & built- ins for storage is the perfect spot for a playroom or mudroom. The fabulous kitchen has new cabinetry w/ quartz countertops, subway tile, Bosch dishwasher, Amana refrigerator & Samsung gas range. New second floor bath has Kohler tub & fixtures & new vanity w/ quartz counter tops. Entire house & garage tuckpointed in 2015, new 200 amp electric panel, partial concrete driveway replacement, newer windows, new sewer line under the basement floor, & new siding. LL recreation room w/ woodburning fireplace & a bar. Upstairs, there are 3 bedrooms and a extra large walk- in closet with built ins. Large deck in back overlooks a lovely, fenced yard. 2 car detached garage. Convenient to Clayton, the Loop & hwys, this home is not to be missed! This beautiful home is loaded with terrific features and is in an ideal University City location near all of the amazing amenities that this fantastic community offers! You'll love walking the tree-lined streets or relaxing on one of two balconies overlooking this beautiful neighborhood! On the main floor, you'll find a large living room, lots of period millwork, a den perfect as a playroom or office, half bath and a gorgeous kitchen with lots of cabinet space, backsplash, built-in microwave, solid surface countertops, gas oven/range and so much more! Upstairs, there are more wood floors and trim details, a full bath, access to the two balconies and four bedrooms, one of which is smaller and has been converted into a closet with a built-in closet system! In the finished basement, there is a rec area, built-in cabinets and another bath with a shower! Outside, the home boasts terrific curb appeal with a parking pad and a huge, fenced-in back yard perfect for enjoying the outdoors! This charming 1.5 story Cape Cod is move in ready with fresh paint throughout, a fabulous chef's kitchen and an incomparable garden oasis right in the back yard! An open 1st floor plan is ideal for entertaining family and friends with a large living room, light filled dining room and a high end, eat-in kitchen featuring custom cabinets, honed black granite tops, stainless appliances, built-in wine cooler and a stunning glass tile back splash. An office/den with built-ins, as well as a guest bedroom and full bath complete the first floor. Upstairs, the light filled master bedroom suite is adjacent to a charming 2nd bedroom ideal for a nursery or office. It's the outdoor space that really sets this home apart from all others. The current owner transformed the yard into a perfectly designed and curated botanical masterpiece with tiered trees & perennials, a zen meditation garden, koi pond with bridge & waterfall and elegant patios providing a tranquil escape like none other right at home! This 1.5 story U City charmer has it all and is a joy to show. You will love the brick and stone exterior of this warm, inviting home. The light filled living spaces include arched entries, coved ceilings, hardwood floors, plantation shutters and renovated baths. The bright, white kitchen features custom cabinetry, solid surface counters and stainless appliances and is sure to impress. Large living room with gas fireplace, stained glass window, separate dining rm with bay window. 2 bedrms on main flr are good size with nice closet space & updated hall bath. Upstairs, find the spacious master bedroom suite and an additional bedroom, perfect for a nursery or in-home office, plus the luxurious master bath. Enjoy entertaining this summer in the lovely landscaped, private-fenced backyard complete with stamped concrete patio. Detached 2 car garage and driveway provide ample off-street parking. Close to parks, shopping, restaurants and public transportation-you don't want to miss this one. Nicely updated and spacious 3 bedroom, 2 full bath all brick ranch in a sought-after U-city area. This house features an oversized 2 car attached garage, wood floors throughout with a beautiful marble entry, main floor laundry, covered deck off of the family room and a walk-out basement which opens to the large backyard. Some of the recent updates include freshly painted interior, exterior, garage and basement, new kitchen countertop and new dishwasher. With U-city occupancy inspection completed this home is ready for you. 2 Bedrooms +Bonus Room! 2 Master Suites. 2 Full Baths. Rooms are large, inviting, light-filled. Front gate, curved walkway, stone front stoop. Terrazzo floors in Foyer & Living Room. Living Room has Marble Fireplace, floor-to-ceiling shelves, window seat above built-in cabinets. Dining Room has long bay window w/ window seat above built-in cabinets. Kitchen has plenty of counters & cabinets. 15 x2019;x7 x2019; Three-Season Room (used year round but not included in home x2019;s square footage) has 3 walls of windows & overlooks charming back yard. 1st floor MBR has En-Suite Bath. Charming staircase to 2nd floor where rooms can be used separately or as large Master Suite-- large Bedroom, hall Bath, & Bonus Room. 1,318 sf plus 15 x2019;x7 x2019; Three-Season Room yields 1,420 sf of Living Space. Deep front yard, lovely landscaping & hardscaping in front/ back/ side yards. Driveway Parking. Newer roof & AC. Great Condo Alternative. 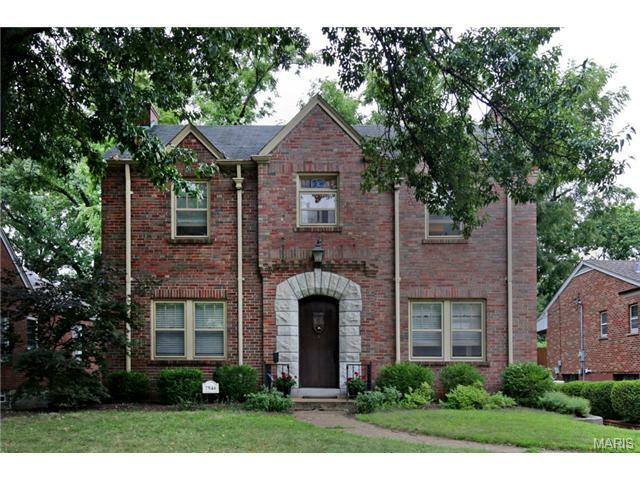 Quiet, walking neighborhood, close to restaurants & downtown Clayton. MID-CENTURY, RANCH ON QUIET STREET CLOSE TO GREEN CENTER/KAUFMAN PARK. Tree-lined streets welcome you to this one level home, with an open designed interior, creating a contemporary & almost loft-like feel. The large airy foyer opens to the spacious LR/ Den combo, where natural light cascades into the home & makes the blonde wood floors gleam. For a more private atmosphere, close the Luxury Custom Window Treatments over expansive LR windows. A full brick fireplace anchors opposite end of this room. The flexible floor plan allows you to creatively use & personalize this space. Separate dining area w/sliding glass doors invite you out to the deck overlooking backyard, or the cozy fire pit. Updated kitchen has newer solid surface counter tops & open concept cub boards which continues the contemporary/loft theme. 3 bedrms & 2 full baths with mid-century tile & color palate, complete the space. Attached 1 car gar. Separate laundry room w/attached cedar closet & ample attic storage.